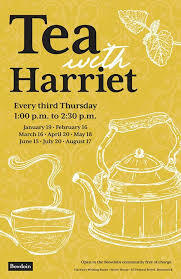 Tea With Harriet: Held the third Thursday of each month at 1 PM. Come have tea and celebrate the life and legacy of Harriet Beecher Stowe through an entertaining talk that highlights different topics relating to her writing, her family and her extraordinary life. The event is free, but due to popularity, tickets are required, and are reserved on a first-come, first-served basis. Log in to www.bowdoin/tea to reserve your spot or to add your name to the waiting list. Tickets become available on the third Thursday of each month for the follow month’s event. Tea With Harriet is held at 63 Federal Street, Brunswick, in the home where Harriet Beecher Stowe lived and wrote Uncle Tom’s Cabin.